Following the amazing success of One Red Dot and Blue 2, David Carter has done it again! He's back with 600 Black Spots, his most clever scavenger hunt pop-up yet. 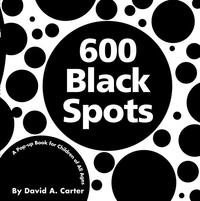 Readers can spend countless hours of fun searching for the black spots throughout the pages--but be careful! Tricks and surprises abound in this endlessly entertaining, keep-you-on-the-spot book!